They are one of the easiest cookie recipes … plus, they require no baking. 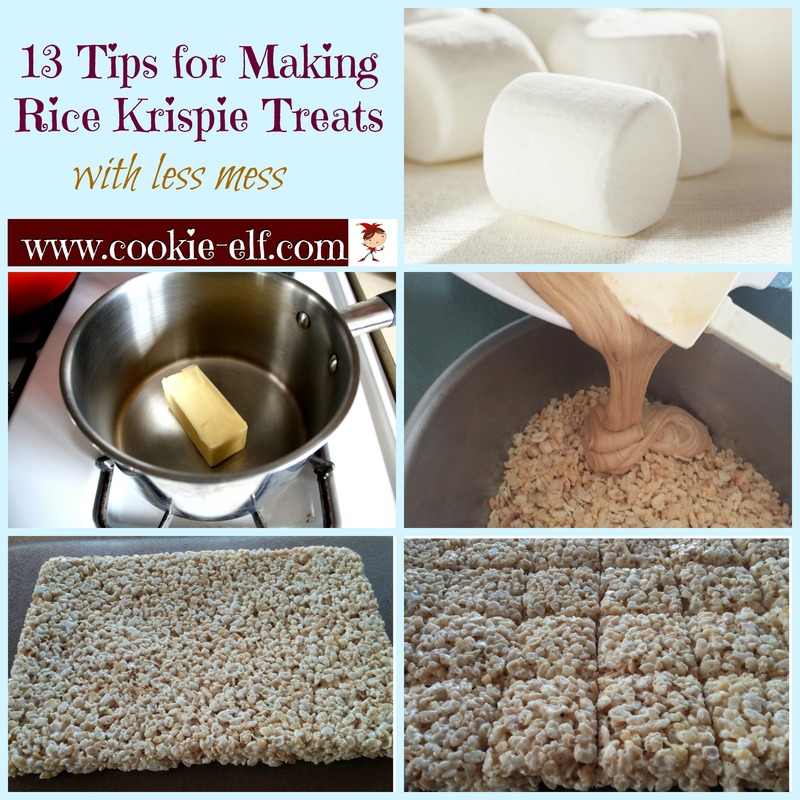 Now making Rice Krispie Treats (RKT) is even easier with these simple baking tips! 1. Save mess. If you’re into less mess, then line your baking pan with waxed paper or parchment paper. When the treats are cool, you can lift the ends of the liner out, place the entire bar on a cutting board, cut the treats, and discard the liner. You can wash the pan but the mess will be minimal. 2. Make treats thicker if you like. You can make thick treats by using an 8 x 8 or 9 x 9 pan rather than the typical 13 x 9 pan. 4. Substitute. When making Rice Krispie Treats, you can replace marshmallow crème for regular marshmallows. Allow one 7-ounce jar per 40 large marshmallows or 5 cups mini marshmallows per 40 large marshmallows. 5. Use extra marshmallows. Most standard RKT recipes (including variations) call for 10 ounces of marshmallows – about 40 large marshmallows or 5 cups of mini marshmallows. That combination, with butter, barely allows enough cereal coverage. Plus, if you mis-measure the cereal or throw in a few add-ins to the mixture, there are more ingredients to coat than marshmallow mixture to coat them. The solution? Don’t skimp on marshmallows. Add some extra – up to half again what the recipe calls for – to make sure there is enough marshmallow-y goodness to cover all your ingredients. You may need to experiment to find your “marshmallow mixture sweet spot.” That’s good. It gives you the chance to make more RKTs. Remember, a cookie recipe is a guide. It’s not sacred. 6. Choose the stovetop or microwave. There are advantages to each. Some cooks prefer to melt butter and marshmallows in a large pan on the stovetop because they can control the heat more readily than in the microwave. Another advantage of making the treats on the stovetop: if you use a large enough pan, then you can add the Rice Krispies directly to the melted mixture (rather than dirtying another bowl, since microwavable bowls are usually not big enough to add the cereal and mix it without making a sticky mess.) The advantage of microwave melting, of course, is convenience. And in hotter months, using the microwave prevents you from heating up the kitchen. Try each method and choose the best one for you. 7. Go slow and stir often. Melt the butter (or margarine) slowly. If you melt it too fast, particularly on the stove top, there’s a good chance it will brown. Brown Rice Krispie Treats look yukky and don’t taste so hot, either. If you’re working in the microwave, melt the butter (and later, the butter-marshmallow mixture) in 30 second increments on high, stirring each time before returning the bowl to the oven. 8. Melt the butter first. Add the marshmallows only when the butter is completely melted – no lumps. Coat the marshmallows with butter before returning them to the burner or the microwave. If you melt the marshmallows too soon or too quickly, you’ll end up with hard Rice Krispie Treats. In either case, make sure the mixture is smooth before combining it with the cereal. 9. Minimize mess. When making Rice Krispie Treats, the mixture can be sticky. Grease your spoon or spatula before combining the melted ingredients with the cereal. 10. Press neatly. Use a piece of waxed paper to press the mixture into the pan evenly with your hand so it doesn’t adhere to the wooden spoon or spatula. Or use The Elf’s favorite trick for pressing a sticky mixture into the pan: wet your fingers. Shake off excess moisture and then press the mixture into the pan. Wet fingers prevent extra mess! 11. Press evenly. Use a pound box of butter or margarine covered in waxed paper as a paperweight, pressing it down on the surface one section at a time across the cookie surface to make it even. 12. Chill the bars. After pressing the mixture into the baking pan, place the pan in the refrigerator for about 30 minutes before cutting. Firmer bars are easier to cut, even though it means delayed gratification for eating them. 13. Prepare the knife. Use a very sharp knife that cuts smoothly through the treats. You can also set the knife in the fridge (along with the treats) or even the freezer (so it’s extra cold). But best of all: butter or grease your knife to keep it from sticking to the bars. You’ll have less mess! Add your tips for making Rice Krispie Treats in the Comments section below!